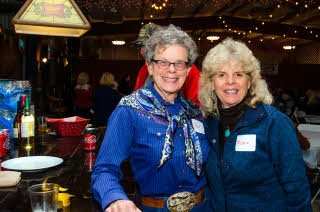 We got together at the Mother Lode Ranch on January 5, 2019, for food, fun, music, and board of directors elections. Mostly food and fun, though. All photos courtesy of Carl Perry. You may jump to the newsletter article below the pictures. This is the first page of pictures. You may read the newsletter article, below, go to page two, to the main Activities page, or Home. 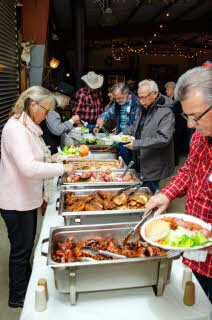 Despite the rainy day the winter round-up accommodated 130 people at the Don and Laurel Rumsey Party Barn. It was the largest group we have had since it was renamed. The raffle prizes brought by the event goers were super plentiful. The count was over 80 raffle gifts. We actually auctioned 4 of them and netted over $1000. 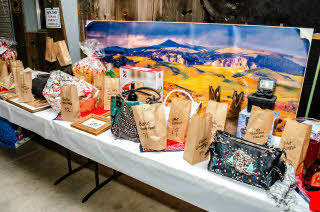 Adding the raffle and the live auction up we cleared $2000. What a great start for the New Year. This event couldn't have been accomplished without the help of my wife Julie. She bought and assembled all the amenites before hand that was needed for the event. She was there every step of the way from start to finish. Our set up and clean up was shared by many of our members and I want to thank them all. Starting with Dave and Jody Rumsey and all 3 of their children Kaitlyn, Michaela and Casey who sold raffle tickets. We also had Karen Barindelli, Katherine Reeves, Jim and Chris Westmoreland, Vicki Morales, Jean White, Larry Sousa, and Jerrie Ann Thomas who helped setup and tear down the tables and chairs. Doug and Kathy Dollarhide and Cristine Kaplan organized and completed the fantastic raffle with ease. 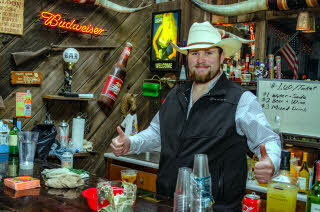 Of course we cannot forget about our table hauler and general work horse John Marshall. I know there were many other people that helped clean up at the end of the night and I want you to know that you all are greatly appreciated. This event is so huge that the only way we can accomplish this event successfully is by the teamwork of the unit. Thank you everyone!! 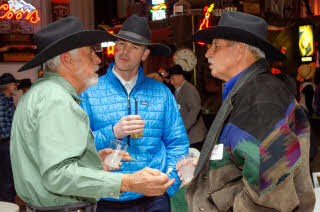 Speaking of teamwork we showed videos of our sponsored World Champion MJC Bishop Mule Days team members. They all took part in narrating the videos and telling of their experiences. 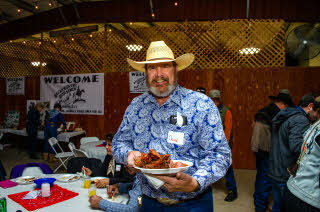 For those of you that couldn't attend the dinner you missed out on the best BBQ ribs and chicken on this planet. I'm sure you will have another opportunity next year so don't miss it. Thank you L and M Blodgett. 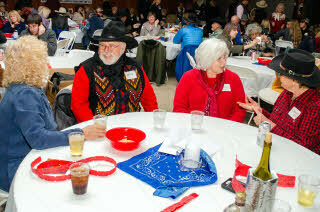 Lance Kell never fails us with his country western music as we had more dancers on the floor than ever before. Even the chicken dance was a big hit. Let's not forget the hospitality of Don and Laurel Rumsey. 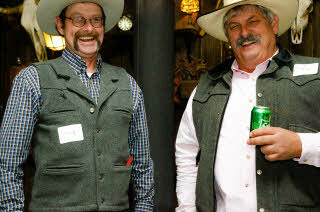 They open up their ranch to us with pleasure. Laurel even cooked breakfast for the people that loaded up all the tables and chairs and help place all the wagons back in their proper places. It takes a tremendous amount of hours of their time to prepare for an event like this and we appreciated you both very much. See you all next year! This is the first page of pictures. You may go to page two, to the main Activities page, or Home.